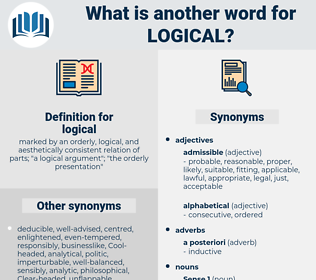 What is another word for logical? marked by an orderly, logical, and aesthetically consistent relation of parts; " a logical argument"; " the orderly presentation"
coherent, logistical, conceptual, straightforward, legitimate, unreasonable, comprehensible, normal, plausible, justifiable, logistic, theoretical, fitting, self-evident, consequent, tenable, cohesive. reasonable, sensible, consistent, understandable, natural, obvious, common-sense, meaningful, inevitable, appropriate, wise. inadmissible, irrelevant, unfair, unsuitable, wrong, unjust, illegitimate, inapplicable. incomprehensible, disorganized, not understandable, unintelligible, unrational, unsystematic. discontinuous, broken, interrupted, infrequent, unconsecutive, intermittent. causal, beginning, Originating, preparatory, Commencing, starting. incompatible, disagreeing, irregular, varying, erratic, inconsistent, incongruous, unfitting, inconstant. optional, unrealistic, unwise, unclear, obscure, unintelligent, unsound, foolish, vague, stupid. implausible, misleading, sophistic, Eristic, unarticulated, flimsy, misguided, loony, unconvincing, uninformed, preposterous, Unreasoned, specious, unjustified, uncompelling, thoughtless, absurd, casuistic, unscientific. This is one reason for the great importance of logical form. I tell you, old chap, this higher criticism is a great thing, and as logical as death itself. lazily, lexical, legal, lasalle, locally, local, low-cal, lescol, lisle, lawlessly, logically, legally, locale, locule, law school, lazuli, lysol, laxly, like hell, lucilia, lugsail, Ligule, lusciously, Lucius Clay, l'aquila, luckily, lozal, loquaciously, loosely, likely.